Despite delaying Manchester City’s title coronation with a win at The Etihad last week, Manchester United contrived to hand The Citizens the title in the worst possible way: by losing at home to West Brom. Central to such a woeful performance was French international, Paul Pogba who only last week had inspired a stirring comeback away at City. United losing means that we are now 16 points behind City, with just five matches left to the end of the campaign. The whole of the United starting 11 lacked fight, underrated their opponents and showed nowhere near the commitment required of players that wear the revered jersey of United. Pogba was shambolic, and was duly hooked off by Jose Mourinho in the 58th minute, yet another humiliation for the club-record signing. 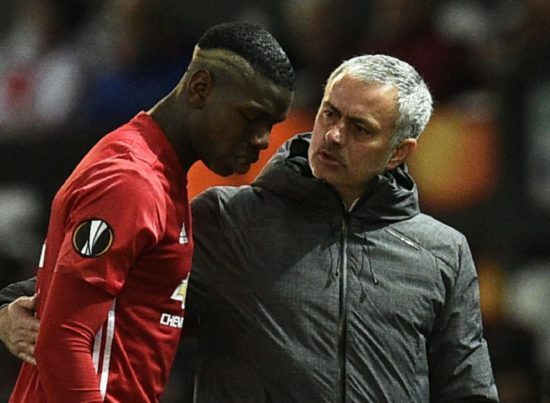 Pogba and Mourinho have been reported to have fallen out after a series of underwhelming performances since the turn of the year, but last week’s display at City was supposed to have put paid to such allegations after the Portuguese tactician defended Pogba vigorously. .
Mourinho slammed the professionalism of his players, and was not coy in his assessment of Pogba. Majority of United fans have taken to Twitter to berate Pogba for his underwhelming performance. Below are some of the best tweets. Despite all of this, #mufc are the 2nd best team in England somehow. Next year really is make or break of Mourinho. 2nd in the league and round of 16 in the UCL won't cut it. If he chooses to sell Pogba and Martial, we're absolutely fucked. Paul Pogba clearly not living up to the big name personality he has. Outside the pitch. Good. Inside the pitch. Inconsistent. Pogba, 25, started the season well before suffering an injury back in September, but he came back roaring after his injury though he has suffered another dip in form since the arrival of Alexis Sanchez, with reports suggesting that the former Juventus man is angling for a pay rise to join the Chilean as the best paid players at the club.